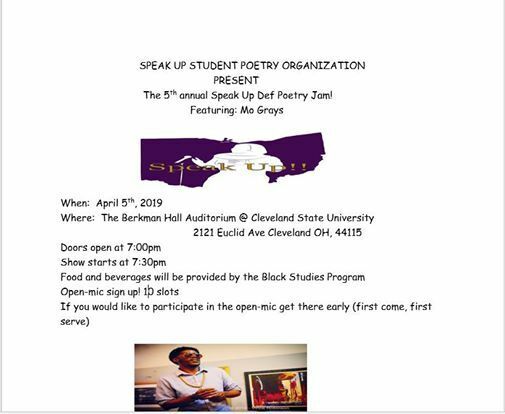 5th annual Speak Up Def Poetry Jam! Join us for the 5th annual Speak Up Def Poetry Jam event! For national poetry month we will celebrate by allowing you all to have an even bigger platform, larger audience, bigger stage to show your poetic talents. In the past great poets such as Dana Gilmour, J. Ivy, Joey P, Too Black and many more have blessed us. This year come check out Mo Grays as he hits the stage with his blazing energy that will leave us all inspired. Sign up for open-mic as well. There will be 10 SLOTS, so please come early if you would like to sign up and perform. Food will be provided thanks to the Black Studies Program. 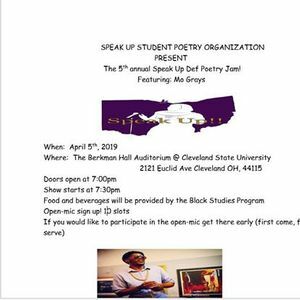 The 5th annual Def Poetry Jam will take place at Cleveland State University inside the Berkman Hall Auditorium.